A great vacation in San Francisco doesn’t really require a pricey airline ticket or hotel stay like some people think. You don’t have to leave the city to get your relaxing on. For those of you with some days off this summer and you desire to stay home, check out these ideas that will keep you entertained and prove that SF is worthy of your vacation days. Your friends may be posting pics from the Louvre and the Uffizi, but who needs the Mona Lisa and the Birth of Venus when there are so many amazing museums in SF? Explore the brand new SFMOMA, have your mind blown and your curiosity piqued at the Exploratorium, meet insects, amphibians, reptiles, birds, and mammals at the California Academy of Sciences, and see some amazing fine art at the de Young and Legion of Honor. Santa Cruz is just a short drive away but has many of the beachside perks of SoCal towns — sunbathing opportunities, surf lessons for beginners, a bustling wharf along with the kid-friendly (admission-free) Beach Boardwalk. If you go on a weekday, you’ll avoid the crazy big crowds, but get over Highway 17 early in the morning just to be on the safe side. Nothing says “vacation” like a day at a spa. Be sure to allow time to enjoy the sauna and steam room, lunch poolside, and a glass of champagne in the whirlpool. You can check the Spas and Wellness Centres in San Francico via Trip Adviso on this link. If your usual vacation consists of more outdoor adventures than urban exploration, ditch the sidewalk in favor of hiking paths. In San Francisco, check out Sutro Heights Park, Mount Davidson and Lobos Creek Trail. Head out of the city to try one of these East Bay outings or visit the Marin Headlands or Mt. Tam up north. There’s nothing that screams vacation more than being on a boat. 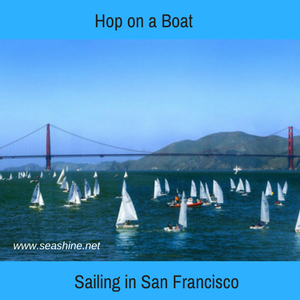 Sailing San Francisco offers private charters and sailing lessons or you can spend a day fishing the Golden Gate aboard the Argo. Looking for something a bit swankier? Boatbound lets you rent everything from 10-foot sailboats to 90-foot yachts and you can even add a captain if you need one. It’s the perfect way to cruise around and drink champagne, go wakeboarding, or sail the ocean blue.